Week 3 with Janice Whiting and "Candles on Your Cake", today she has created this elegant confection with an offset tiered cake (I wouldn't have thought to do that since I don't make real cakes like these!) and added some beautiful stamped sunflowers from "Theresa's "Autumn Beauty" set! I love how she put it on a diamond scored white card base, just reminds me of an intricate pattern on the side of an iced cake! The tiny ribbons and papers just pull it all together for an over the top elegant card celebrating any fancy occasion, not just for birthday! What kind of yellow ribbon is that on the card? I have recently started feeling the back, white and yellow color combo becoming one of my favs. I love the way you did the cake. This is beautiful and LOVE the colors. Janice is doing such a fabulous job as GD for you!!! In case anyone else wants to know, I actually colored some light pink, super thin ribbon that I got in a grab bag at Hobby Lobby with my Copic marker YR23 to get that yellow color! I needed something really thin since I was working with a small image and this tiny, satin ribbon worked perfectly (it is 1/16th of an inch wide!). 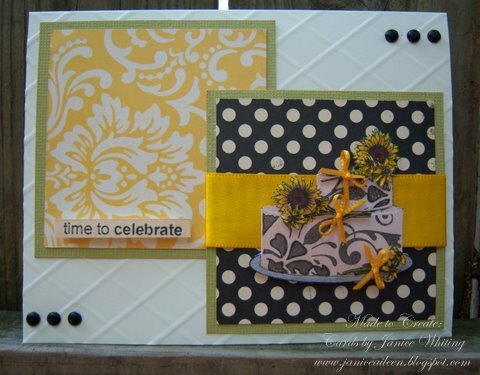 Janice's card is gorgeous! I love the scored background and the striking color combo! Wonderful details on the cake!